Final Frontier Design's spacesuit during initial pressurization. A private spacesuit company and an astronaut-training organization are teaming up to give private astronauts on simulated spacewalks a more spacelike experience. With a Kickstarter campaign underway to simulate spacewalks on Earth, Houston's Waypoint 2 Space announced a new partnership to integrate spacesuit design ideas with the simulator. The company plans to work with Brooklyn-based Final Frontier Design to integrate life support systems into the spacewalk simulator and other training systems. Final Frontier Design was founded after winning the NASA 2009 Astronaut Glove Challenge. Ted Southern and Nikolay Moiseev, former competitors in a NASA glove challenge, teamed up to run the company. 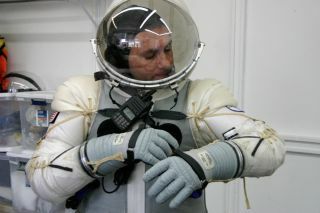 Their business also offers a spacesuit "experience" that allows anyone to don the pressurized garment and move around. "Waypoint to Space embodies a forward-looking, ambitious, 21st century space-training doctrine, one which embraces high-technology solutions and maintains cost-effective infrastructure, while most importantly, opening outer space to the public," Southern, Final Frontier's president, said in a statement. "We are excited to participate in the future with them." The completed simulator will sit inside a dark room and will be able to move horizontally and vertically. Trainees will use their spacesuit lights to figure out where to move. Waypoint representatives will also project star fields on the walls of the room to enhance the sensation that the amateur astronauts are in space. At the moment, most spacewalking training is limited to professional astronauts who have access to facilities such as NASA's Neutral Buoyancy Laboratory, which is a giant pool in Houston with a mock space station inside.